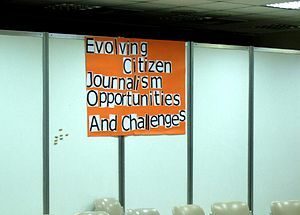 Reading Maria Purdy Young’s take on UGC (Citizen Journalism: Something for Nothing Won’t Last Long) I remembered Bild‘s 2008 announcement that it planned to pebbledash basic digital cameras around its potential audience, to try and boost the paper’s photographic network. According to Bild’s picture editor, the newspaper now receives something like 4,000 photographs a day, and the service has led to nearly 1,000 lead stories. (More here, courtesy of Google Translate). The mind boggles as to how Bild process all that content pouring in, or whether they respond to everyone who makes a submission (I doubt it’s possible) but it really is the whole River of UGC idea that the regional press has been so intrigued by in recent years. Bild is, of course, huge – 2.2m copies a day – with a vast audience and the amount of photos, tips and more it receives are correspondingly vast. But I remember thinking. at the time Bild and Lidl announced their plans, how wonderful it would be if only the Liverpool Daily Post could give free or peppercorn cost Flip cameras to people. Because, as Maria Purdy Young says, something for nothing won’t last. In fact, something for nothing shouldn’t last. There should be an exchange – it doesn’t mean a financial one but an acknowledgement that both sides are benefiting in some way. Flickr groups are a case in point; when David Higgerson and I worked in Liverpool we had to learn the nuances of running a group where some images were printed, free, in the newspaper. Ultimately, it worked – the Flickr group members and the Post&Echo worked out a exchange/balance – but if we hadn’t, I think the groups wouldn’t be the effective, healthy communities they are today. There’s a quote in the Purdy Young article: “CNN has been relatively forward-thinking in its approach to citizen journalism,” he said. “They mix iReport content (from unpaid citizen journalists) right in with the professional CNN content. But it’s not so simple as you hand a camera to someone and then you fire a journalist.” (it’s attributed to someone named only as Myers, who isn’t referenced elsewhere in the piece). No doubt having your video in amongst the ‘pro’ news video will satisfy some contributors whereas others will feel short-changed. Either way, I doubt CNN worries about its UGC exchange balance too much – they aren’t going to be dependent on the same contributors all the time. It’s like the regional news organisations view of the nationals: They come in, trample over everything and leave, whereas we have to live with the consequences of our actions. But for local papers, getting the balance right is crucial, and it will involve investment – cash, time, knowledge-sharing are just some of the things we will have to be prepared to exchange. Frankly, I think there could be a steep learning curve on this one.